Sennelier is a French company founded by Gustave Sennelier in 1887. During its business, it was patronized by artists like Cézanne, Gauguin, Monet, Bonnard, Soutine, Picasso, Modigliani, Kandinsky,Chagall, and Dali. 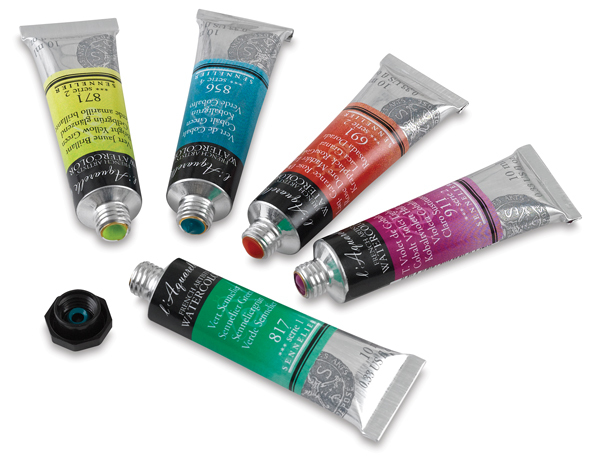 French Artists' Watercolours represent the newest evolution of the Sennelier line. With an increased honey content, they offer an amazingly smooth consistency and extraordinary luminosity — plus the lightfastness desired by today's painters. The range features: 5 series, Exceptional pigment concentration. 57% of colours are mono-pigment. 25% of colours are unique to Sennelier.